When my son was younger, getting him to make any decision was like pulling teeth. Each morning I would ask him what he wanted for snack at school. Without fail, it would take him at least ten minutes to answer. After a while I stopped asking and he got whatever I chose. Now that he is in his tween years, the decisions he has to make are harder than figuring out if he wants an apple or orange for snack. I can’t be with him 24/7 and therefore I need to make sure that when he is faced with hard choices, such as standing up to a bully or walking away, he has the tools to do so. It is important that we teach children the valuable life skill of making good decisions. It is a skill that will help them be successful in childhood and as they transition into adulthood. The following are some suggestions of how you can prepare your children to become good decision makers. 1. Allow your child to make age appropriate decisions. For example, you can ask them what food they want for breakfast or what activity they want to do. I suggest that for young children you give them two options to choose from. Do you want pancakes or waffles for breakfast? This way they get to make a decision, but don’t get overwhelmed with having too many options to choose from. 2. Ask for their input when making decisions that affect the whole family. Maybe your family has plans to go see a movie or go out to dinner. Include your child by asking them what movie they prefer to go see or where they want to go for dinner. Again, I would suggest giving them options to choose from. Not only does this get them to practice decision making, but they get to see that they are an important part of the family and that their opinions are valued. 3. If it won’t cause harm to them or others, allow your children to make mistakes. As parents, many of us want to protect our children from disappointment and failure. However, people learn a great deal from trial and error. When they use mistakes as opportunities for growth, children learn how to improve their decision making skills. They get to see the outcome of their choices and are better able to handle the same or similar situation in the future. 4. Practice what you preach. Kids are always watching what their parents do. When they see you making good choices, they are more likely to do the same. For example, if you want your child to make healthy food choices, you probably shouldn’t scarf down a gallon of ice cream in front of them. It sends them a conflicting message and they are more apt to think, if it’s OK for mom and dad to do, then why is it not OK for me? 5. Talk it out. When you are making a decision, talk out your process so your child can hear. For instance, let’s say you want to buy a new pair of shoes but don’t have the money right now to purchase them. Here’s an example of how you would talk it out. I really want to buy those shoes but if I buy them now, then I won’t be able to get the movie tickets. I could buy the shoes but miss out on the movie, or I could go to the movies and get the shoes another time. I guess I have to decide which one is more important to me, the shoes or the movie. Even though sometimes it doesn’t seem like it, you have a lot of influence over your children. When you model your decision making process for them, they will usually mimic you. The following are some activities you can engage your children in to help teach them good decision making skills. Each episode focuses on an ordinary, everyday situation or “challenge” that young children may encounter in the home, with friends, in the community or at school (like jealousy, peer pressure, a new neighbor, a bad grade – or lack of “quality” family time). A path to resolving this common problem is provided as Brother and Sister (and viewers) see the consequences of the choices and decisions that they make. As each storyline progresses, family members interact to reveal solutions to conflicts and illustrate valuable life lessons. PBS Kids provides a great list of activities here for kids to practice making decisions. 1. What was the problem in the story? 2. What are some ways the characters could have solved the problem? 3. What might have happened if they chose any of the solutions you mentioned? 4. How did the character choose to solve the problem? 5. What was the outcome? 6. How would you have handled the situation? These questions are designed to help kids learn how to think through a problem instead of acting impulsively. What if you found a hundred dollars, what would you do? What if a stranger tries to talk to you? What if your sister took your toy without asking? What if you classmate doesn’t invite you to their? Playing the ‘what if’ game gets children to stop and think about what they would do if they were faced with a particular situation. You can also find another great resource here for helping children learn to become good decision makers. Additionally, here is a wonderful video about decision making and it has great scenarios for kids. What are some ways you foster good decision making with your children? I would love to hear about them in the comment section below. Please don’t forget to click on Top Mommy badge to vote for me once a day! I love this! It is so important that we teach our children how to make their own decisions and how to effectively problem solve. One day they’ll be grown and doing it all on their own, we need to prepare them for that day! Very true Brandyn. I would love to keep my kids close always, but that’s not the reality. I would hate for them to be under-prepared. I love the idea of the hypothetical questions. What a great exercise! Nice post! Thanks Bridget! I appreciate you taking the time to read! The what if game is one of my faves. It really helps to work on those decision making skills. Great post! I participate in most of these with my kids. I love movie night. I get to see their reactions to certain scenes in the movie and we discussed how they would react or should react. I especially love playing the what if games with them. Oh this is a tough one. I sometimes wonder about this (and whether I had made the right decision too!). Our child is going into his tweens and we give him an hour break each day from homework to let him do any recreational thing he wants, but we do give him tips e.g. if he watches TV vs if he reads a book vs. if he plays outside in the garden. We do tell him that what he does in that hour has consequences. Hello Yanique, this is really smart advice. I especially like the part about letting children fail. I think I tried too hard to make sure my kids never failed, but it is important for them to see that you learn from failure. This is a message I just don’t see often enough in the world. I’m guilty of trying to intervene to stop my kids from making mistakes. I realize that when I jump in to save the day, they don’t get to practice problem solving on their own. They won’t be under my watchful eyes forever. I need them to be able to make good choices on their own. As an adult who constantly wonders if I’ve made the right decision, I really want my children to feel confident in their decisions. 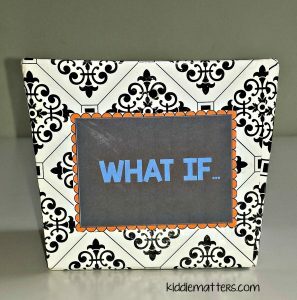 I especially love your idea for the “what if..” game! Games such as that are so great for teaching skills. Thanks for sharing! All great things to think about it so easy to make all our children choices for them, and they grow up not trusting their own choices in life. I’m guilty of doing some of these sometimes, and thanks for reminding me of what I’m really doing is not helping them Great Post! Thanks for sharing! Robin I’m guilty of trying to shield my little guys as well. My daughter fights me on this so I know she will have no problem holding her own. My youngest son however, always looks to me when he has to make a choice. We are working on him being confident in making his own choices, even if it doesn’t work out the way he wants it to! These are great tips. I especially love the one about letting them make mistakes. So often these days, parents are afraid to give kids any leeway to become self-sufficient independent people, and making mistakes and wrong decisions is part of that process. Good list. Absolutely Lou. If they never learn how to fail, it will be hard for them to learn how to succeed. Making mistakes is a natural part of life. I like hat you give answers to the hypothetical situations as well. That is a great idea! Great post, I really like how you gave suggestions on specific activities. Definitely saving this for a few years down the line. Thanks Julie. I’m glad you found this useful. It is an important topic. Though my kids choices are not appealing, I should let them make the choice. I love the decision making activities – using shows or books are a great idea. Thanks for linking up to the Bloggers Brags Pinterest Party. I have pinned your post to the Bloggers Brags Pinterest Board. This is great advice! Sometimes we want to choose everything for our kids & we forget that they are people too. They want & need to make their own decisions just like us in order to grow & learn from their mistakes. Absolutely. Some of the best lessons I’ve learned are from the mistakes I’ve made. I appreciate stopping by! ‘What-ifs” are my favorite. It is like keeping them one step ahead of the game! What a brilliant post! I absolutely agree. Something a friend said — when the twins were born — that really stuck with me was that ‘as parents, we’re not bringing children up, we’re bringing adults up’. Everything they’re taught now, influences how they make decisions — or behave — in later life! It really resonated with me. My husband tells me that all the time. We are raising adults and we want them to be prepared to take on the challenges of life. Thanks for stopping by and I look forward to linking up next week! Love this post! It’s good to instill good decision making processes in our children while they are young. It will stay with them the rest of their lives. Thank you for tossing your hat into the ring at the Party Under The Big Top! I hope to see you again next week! A very thoughtful piece. I agree it’s important we support our kids in learning to make their own decisions, which means we have to learn as parents to step back occasionally in the knowledge that some of the decisions they make might not be right. But if our kids never get the opportunity to make their own decisions, how will they ever learn and grow? I always think one of the most important parenting skills there is is to know when to intervene and when to step back. Absolutely. It’s such a delicate dance to figure out as a parent when to intervene and when to step back. So many children grow up and are paralyzed by indecision because they haven’t developed adequate decision making skills. It is hard getting them to accept other choices to do things. I usually alternate which child gets to choose so they all get a chance to pick. Evenwith that they still argue! This is really interesting. Elsa is only 19 months old but I have started to get her involved in making decisions about things like what she wears and what she wants to eat. I also like to ask her what activity she wants to do, even though she picks puzzles every time. We have also found that giving her two choices helps with discipline too. For example if she doesn’t want to tidy away Daddy will say ‘do you want to tidy the books or the toys?’ and then she picks one and Daddy does the other. If you just ask her to tidy up she won’t do it! Some great ideas here to help develop decision making. I particularly like the one about discussing characters decisions after reading a book. My children are quite young but they love listening to stories so this is something I could do with them. So many teachable moments occur when we read to our children. It’s a great time for them to practice critical thinking. Thanks for stopping by! Love this! I also use storytelling as a model for good decision making. I was watching a tv show and they talked about “priming your space” by have only good choices to choose from. I thought this was interesting, for example, instead of a donut and apple, you have an apply and carrot to choose from. Good way to give kids choices while “priming” them for a positive experience. Although, I firmly believe that failure teaches things that nothing else can. Very thought provoking! Thanks for sharing. Tweeted! Elizabeth I like that! I’ve never heard of priming and it is definitely something I will add to my tool kit. Thanks for sharing! We have four grown children, whom we homeschooled, who grew up to be wise, intelligent people who think before they act and make good choices. As you observe, it’s a day to day thing, working with our kids, just living, and giving them more and more responsibility as they grow older — we read, talked a lot, discussed, did chores, just did stuff. Crucial to good decision making is allowing kids to disagree with us, as parents, and to not feel that they must think the way we do, or like the things we like. Sounds obvious, but a lot of parents see it as “disrespectful” or “not under authority.” Part of being a good decision maker is that you can stand up for yourself, with grace, and hold your ground — lot of adults who can’t do that, sadly. You hit the nail on the head Carolyn. When I was growing up I heard constantly from my parents that it was either their way or no way. In some instances they had to put their foot down. However, because they did it so frequently for a long time I second guessed myself and was always looking to them to guide me. It took a while for me to trust that I could have my own opinion and be comfortable expressing it. I love this…especially the part about letting them make mistakes. Definitely something I’m working on, as I like to fix everything. Thanks so much for linking up at the Manic Mondays blog hop! Hope to see you at the next one! I hear ya! It’s really hard for me to watch my kids make mistakes, I have to constantly remind myself that I am raising adults and won’t be around forever to save them. Thanks for dropping by. Looking forward to linking up next week! This is a fabulous post full of useful ideas. I think every parent should read this as it’s such an important lesson to teach your children. This is such goodness! I think kids struggle with decision making sometimes. Especially nowadays when there are more and more decisions to be made. I want to be more present when I ask my daughter to make decisions. When she makes bad decisions/choices, I’m good at talking it out with her, but just easy decisions need more attention as well. It’s amazing now many choices kids must make on a daily basis. I feel like this generation of children are being asked to grow up so quickly. I too forget to be present for the little things and definitely an area I can improve in. Thanks for stopping by! Great post! Thanks for linking up at the Thoughtful Spot Weekly Blog Hop! We hope you join us again next week! This is such a great post! I love the “What If” game. This will be a great game to play on our upcoming road trip. I’m glad you liked it. That’s genius. I never though about playing it on a car ride! Oh my goodness….I know some kids that never can make a decision! Thanks for sharing your post with us at Totally Terrific Tuesday! Your insights on decision making a very good. At times, it is difficult for even parents to make decisions and if we help our children make better decisions when they are young, they will use the skills when they get older. Art helps children make better, more creative decisions as well. They will see the problem in a different way. So true Gail! Decision making is such an important life skill for both young and old. The sooner we learn how to make good decisions the better. Thanks for commenting! These are really great tips!! I live by number 1. Choice is sooo important! Yes! I’ve avoided many power struggles by offering choices! Thank you for writing this! My son is 2 years old now, and we’ve been trying to give him choices. You’ve given some great advice. It’s SO important to practice what you preach. This is a great lesson to include! YES! Kids eyes are always on us! I always hope I am arming my kiddos with the right decision making tools. Sometimes it’s hard to tell, but we do the best we can, right?! Thanks for sharing, this is truly important for becoming independent. We will not always be able to be there for our kids, so for them to be able to make the best decision for their lives is important. The more we prepare our kids the better off they will be! 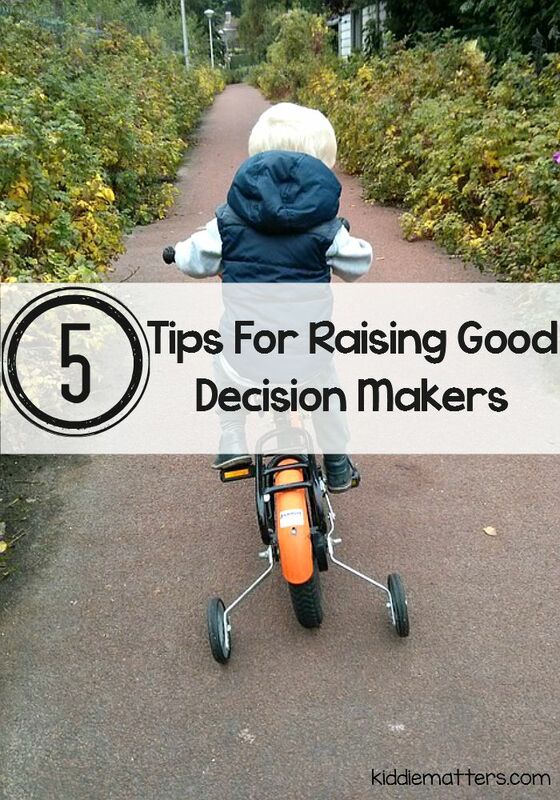 Great tips for helping kids make decisions. My son is entering kindergarten, and I worry about him making the right decisions there. But, you’re right. It’s OK to make mistakes too. Good luck to your munchkin as he starts his academic career! Excellent post, I love your strategies for learning decision-making. Some strategies promote critical thinking skills. Thanks! It’s so important to get kids to think critically! What a fantastic post Yanique! It’s so important that we teach our kids how to weigh options, not always need the instant gratification and how to make decisions for themselves. Thank you for putting this info so concisely! It is so awesome that with this advice, it puts the responsibility in the children’s hands! Love that it says to let them make mistakes. The lessons I learned the best were the ones I learned the hardest! The lessons I learned the hard way are the ones I remember the most! these are GREAT tips, I had to pin them. These are great tips and I especially agree with #3 on your list, allowing mistakes. Many adults seem afraid to let their child fail at anything and overcompensate for him/her. This dangerous practice can create risk averse adults and problems throughout life. So true. We learn so much from trial and error. I completely agree that our children need to learn how to make decisions. In the beginning, when I would give my boys choices they would sit there forever before either deciding or I would break down and say, “This is what you are getting”. Now as they get older, it is so important to equip them with the tools they need to make harder decisions than cereal or pancakes. Great post! Absolutely. Kids grow quickly and the more we equip them with the tools to think critically, the more prepared they will be for the real world! 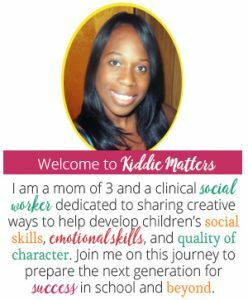 Get Kiddie Matters Delivered To Your Inbox!